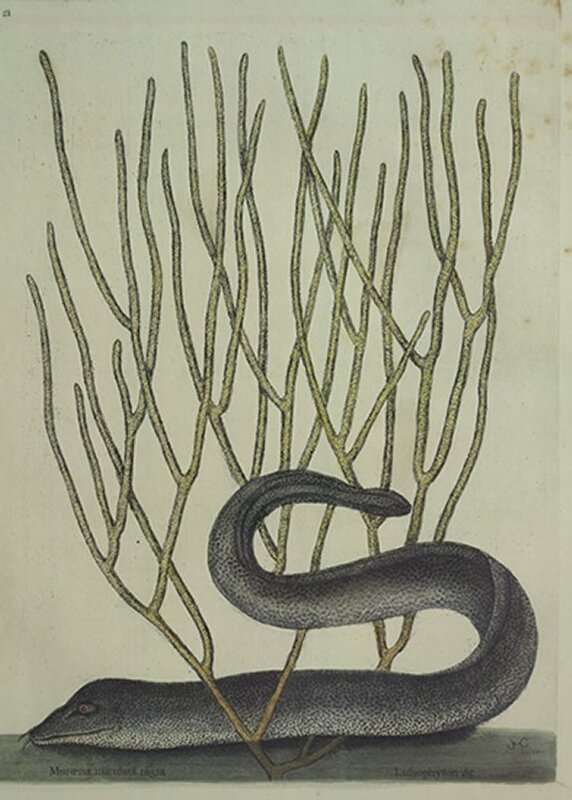 The Form of these is like that of the green Murey differing only in Colour, their being black and spotted all over, very thick with blacker Spots; they are very ravenous &strong and when pulled out of the Water with a Hook and Line will by their violent twistings break off and often bring up with them Branches of Coral or other Sea Vegitables amongst which they sport, and are mostly found. Some of them arrive to the Length of four Feet, tho' they are most commonly smaller. These, as also certain other Submarine Productions, are mostly found to abound in quiet Coves or small Bays of the Sea, defended from the impetuosity of the Waves by Rocks: And as little Birds retreat to Bushes for Security from Hawks, so do the small defenceless Fish to these quiet Places, where these and innumerable other branching Coralline Plants serve them as a hidden Retreat to evade the Attacks of these Mureys, and others of the rapacious kinds of Fish: Tho' I have seen many of the Coralline Plants growing, I don't remember in what Manner these grow, whether erect or lying on the Ground, I rather think the latter from its flexibility and weightiness of its Branches: While growing in the Sea or immediately cast a-Shoar, its Bark is of a deep yellow Colour and perforated with innumerable little Holes.